A nighttime tourism program at Changdeokgung palace will commence on Aug. 23, the Cultural Heritage Administration announced Monday. 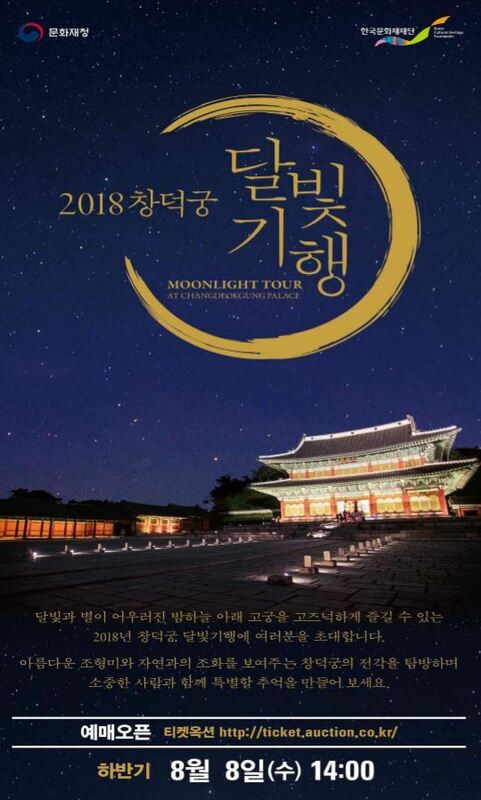 The annual “Moonlight Tour at Changdeokgung Palace” allows visitors to stroll around the Joseon-era palace after hours, with commentaries by tour guides on the history of the Joseon era, photo opportunities with palace guards in traditional garments, and traditional performances. Tours will be provided in Korean, English, Chinese and Japanese. Koreans can join the tour on Thursdays, Fridays and Saturdays, while foreigners can visit on Sundays, when foreign commentaries are available. It is held from Thursdays through Sundays, once a day from 8 p.m. to 10 p.m. from Aug. 23 to Sept. 15, and twice a day from 7 p.m. to 9 p.m., and 10 p.m. to 12 a.m. from Sept. 20 to Oct. 28. Tickets are sold at http://ticket.auction.co.kr or 1566-1369 with up to 100 visitors allowed per tour. All visitors must prebook tickets, which will be made available online from 2 p.m., Aug. 8. One person can book up to two tickets, and for the disabled and senior citizens aged 65 or older, 10 tickets per tour can be booked by phone. Tickets cost 30,000 won per person. For more information, visit www.chf.or.kr or call 02-2270-1243. Built in 1405, Changdeokgung was used as the primary royal palace of the Joseon era from the time Gyeongbokgung palace was burned down during the Japanese invasion in 1592 to when it was rebuilt in 1865. It is the only Joseon era palace designated as part of UNESCO World Cultural Heritage, having been inscribed to the list in 1997.